This is a landmark moment in a long project – Tarantis now has walls! Today I finished the temple section and then started working on the walls. I eventually got about 60% around the town and then had to do something else, so I started ‘humanizing’ the map. What do I mean by humanizing? Well, the original map was very much laid out on a grid and has a machine-feel to it as a result. I simply took a great deal of the town off of the grid and this makes it more friendly, more natural to the human eye. How? Well, I basically just rotated groups of buildings by 1 to 3 degrees then shifted them as needed so the roads continued to work. 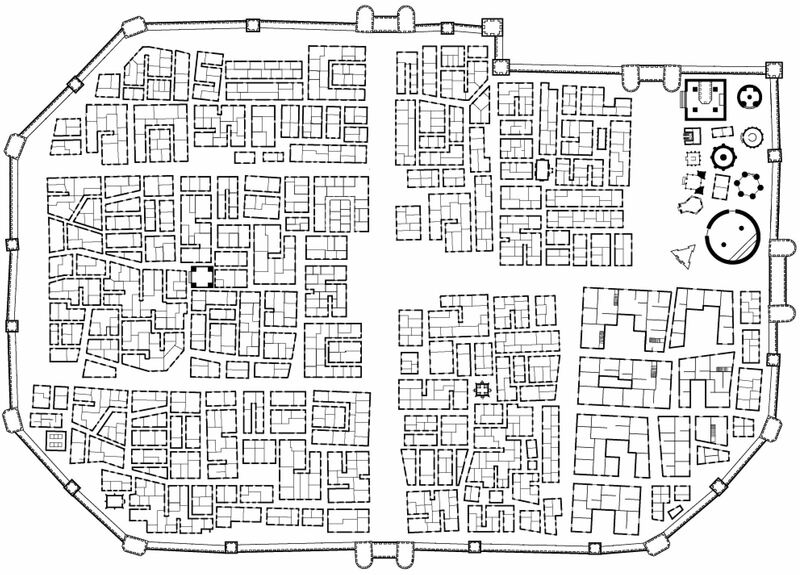 As I built the walls, I was also careful to make sure that the lines were off at angles and also shifted the watch towers back toward the center of town so they would not provide cover to enemies. I also constructed rounded gates and all 4 city gates use the same basic format. It felt great to finally close the wall! I immediately stopped working on it – I’d been going a bit longer than I should, wanting to get it finished. I still have a long way to go before the project is done, sometimes the work itself encourages you and should help keep me working on it.